What Megaventory Triggers and Actions are Supported? Delete Product - Triggers when a Product is Deleted. New Discount - Triggers when a new Discount is created. New Supplier - Triggers when a new Supplier is created. Update Tax - Triggers when a Tax is updated. Update Currency - Triggers when a Currency is updated. Update Category - Triggers when a Category is Updated. New Tax - Triggers when a new Tax is created. Delete Client - Triggers when a Client is deleted. Update Inventory Location - Triggers when an Inventory Location is updated. New Work Order - Triggers when a new Work Order is created. Update Client - Triggers when a Client is updated. New Inventory Location - Triggers when a new Inventory Location is created. New Currency - Triggers when a new Currency is Created. Delete Inventory Location - Triggers when an Inventory Location is deleted. Delete Category - Triggers when a Category is deleted. Update Product - Triggers when a Product is Updated. Delete Supplier - Triggers when a Supplier is deleted. Update Supplier - Triggers when a Supplier is updated. Delete Tax - Triggers when a Tax is deleted. Delete Currency - Triggers when a Currency is Deleted. Update Discount - Triggers when a Discount is Updated. Delete Discount - Triggers when a Discount is Deleted. Insert a New Currency - Creates a new Currency. Insert a New Discount - Creates a new Discount. Insert a Product Category - Creates a new Product Category. Insert or Update a Product - Creates or Updates a Product. Insert a New Inventory Location - Creates a New Inventory Location. Insert or Update a Supplier - Creates or updates a Supplier. Insert or Update a Client - Creates or updates a new Client. Insert a Purchase Order - Creates a new Purchase Order. Insert a Sales Order - Creates a new Sales Order. Insert a New Tax - Creates a new Tax. Insert a Work Order - Creates a new Work Order. 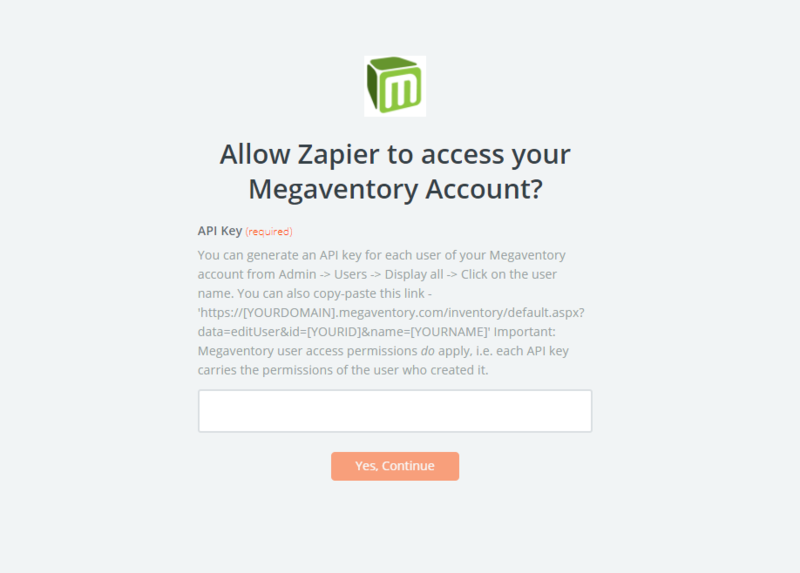 To get started with Megaventory on Zapier, first you will need to click to connect your Megaventory account to use with your Zap. 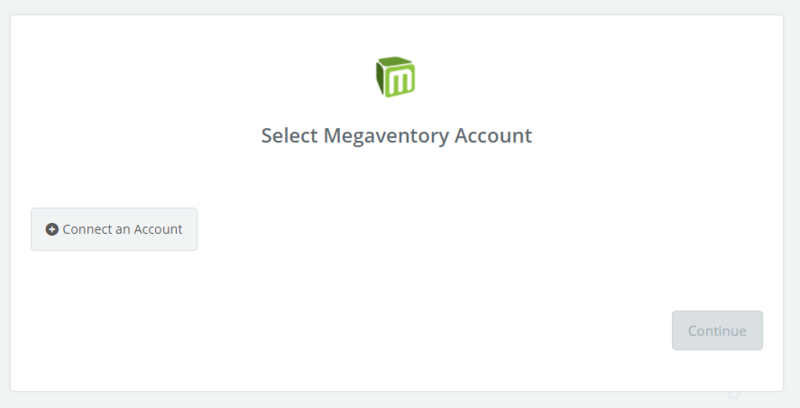 Next, you'll be asked to enter your Megaventory's API key. Click on your "Avatar" icon at the top right corner. Click the "small key" icon in order to Generate your API Key. Paste your key back into your Zapier account and then “Continue”. 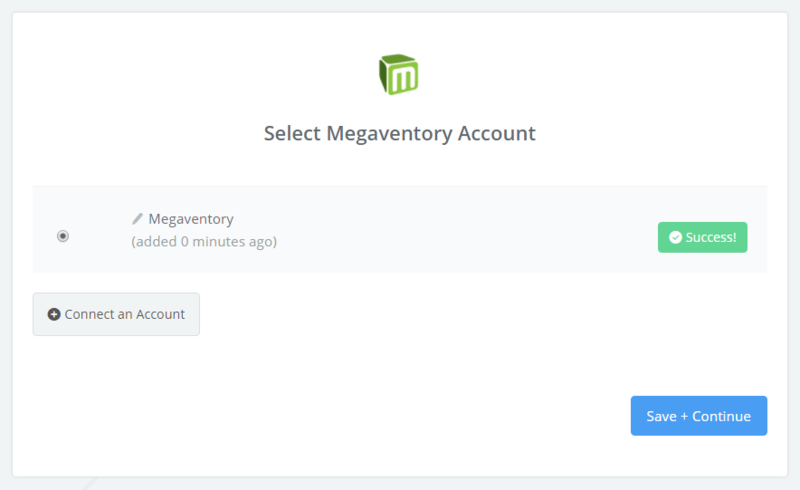 If your API key was entered correctly your Megaventory account will now be successfully connected.